LAKE FOREST, Ill. (AP) The NFL suspended injured Chicago Bears linebacker Jerrell Freeman 10 games Monday for violating the league’s policy against performance-enhancing drugs. It was the second PED suspension in as many years for Freeman, who received a four-week punishment last season. The league says he will begin serving this one immediately. A sixth-year pro, Freeman is on injured reserve because of a pectoral injury he suffered in a season-opening loss to Atlanta. He also suffered a concussion in the game that he said could end his career and is at the root of the latest PED violation. Freeman posted Monday on Twitter that he deliberately downplayed his head injury and has ”been lying to friends, family and loved ones” who ask if he’s OK. He said he has experienced memory loss. 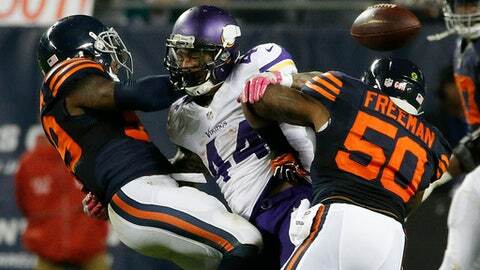 Freeman led Chicago with 110 tackles – a team-high 86 solo – last season. He was with the Colts from 2012-2015.